Discussion in 'General Knife Discussion' started by CO_EDC, Aug 8, 2018. 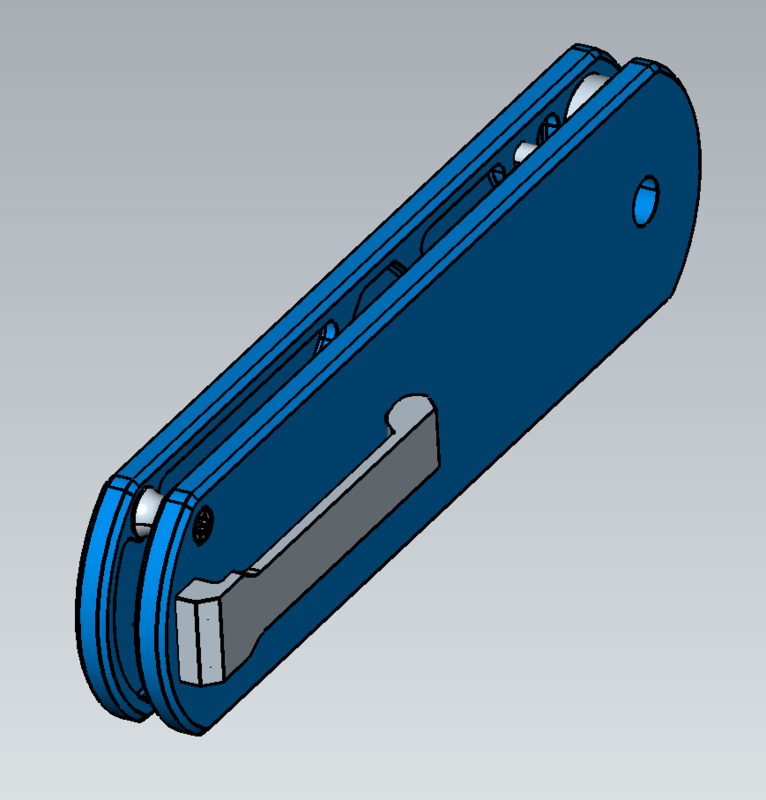 I just finished up designing my first knife and locking mechanism. 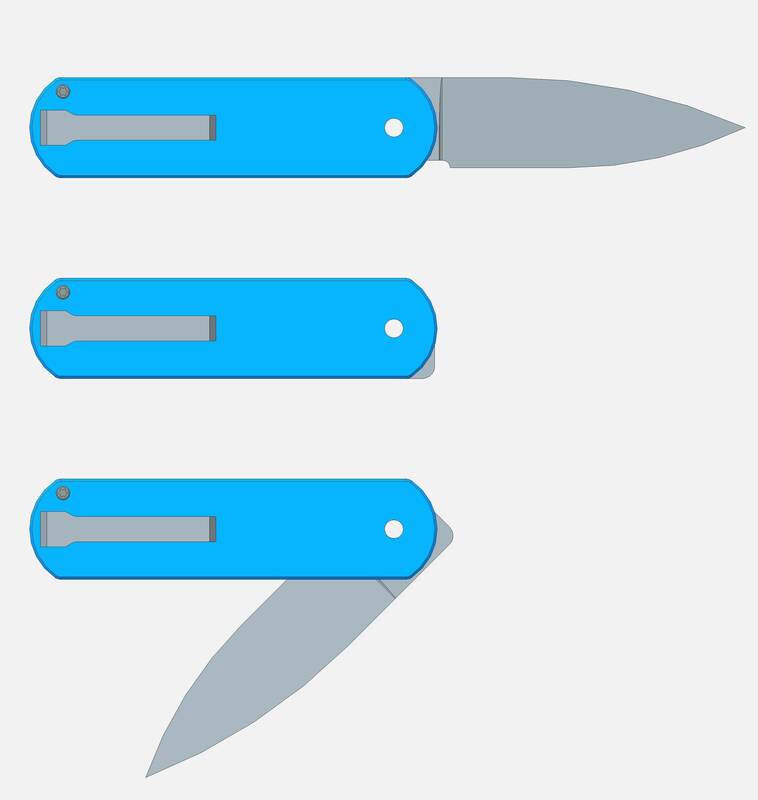 The lock is a button lock but designed for a manual folding knife (not an auto or assisted knife). This made it a bit tricky and I now see why there are practically no manual button lock knives out there. But I think I've come up with a design that will have a good "detent" leading to a good action and solid lock up. What do you all think? I'm hoping to start prototyping in the next couoke weeks (with aluminum). tyyreaun, mrknife, The_Iron_Joe and 3 others like this. I think it's a very, very cool idea. I'm very fond of button locks and front flippers, so a well executed combination of the two would be very appealing. I also think you've chosen well in the simple, practical blade shape and neutral handle shape. My two criticisms are that I don't see the need for titanium on the handle scales beyond adding a little 'Wow' factor and I have a personal dislike of 3D machined clips, as I feel they're largely an expensive aesthetic touch that can easily detract from functionality. TBF, I think those features may be a big plus in the eyes of many knife enthusiasts, but if you have the capacity I think a lower cost model with aluminum and a spring clip would be very, very cool. Thanks very much for your input. My "target audience" you could say is that mid-high end knife enthusiast. But if this lock mechanism ends up working well I do like the idea of creating a lower-cost model. Aluminum, spring clip and washers instead of bearings would be easy modifications to my current design . Thanks! I'm quite interested in your lock design. It's the thing I like most about pocket knives. You seem to use the term "button" and "ball" interchangeably but that doesn't seem right, or at least it's not the common usage. When most people refer to "button" locks they are referring to "plunge" locks -- and those are common enough on both automatics and manuals*. When most people refer to "ball" locks they are referring to Spyderco's "ball bearing" lock. As far as the rest of the design goes, I think you will find a lot of enthusiasm from BF members for a clean, simple, medium-sized front flipper like you propose, myself included. * See manual production knives from CRKT, Hogue, Spartan, Freeman, Protech, Tighe, Rockstead, Real Steel, Gerber, Klotzli, et al. You seem to use the term "button" and "ball" interchangeably but that doesn't seem right, or at least it's not the common usage. When most people refer to "button" locks they are referring to "plunge" locks -- and those are common enough on both automatics and manuals. When most people refer to "ball" locks they are referring to Spyderco's "ball bearing" lock. As far as the rest of the design goes, I think you will find a lot of enthusiasm for a clean, simple, medium-sized front flipper like you propose. Good catch, I updated my first post. It is purely a button lock, not sure why I wrote "ball lock" a couple times. Thanks for letting me know! Once I get a couple prototypes done I will show how the button lock I've designed works. I have a couple things I can adjust in the design to either strengthen or loosen the "detent". The only production button lock manual flipper knife that I've been able to find is the Hogue X5 but they use a small spring "liner" with a detent ball. Just today someone told me about a couple custom knife makers (Brian Tighe and Rod Olson) that have done it as well. If you know of any others let me know! I'd be interested in seeing how they implemented it. Edit: I see you list of knives now, I will check them out! Thanks! If you know of any others let me know! I'd be interested in seeing how they implemented it. See my updated post. I think I was editing while you were replying. My favorites from that group are the Freeman 451 and the Klotzli SBG, both "mid techs." I haven't handled a Rockstead or a Tighe, the other two "mid-techs" on that list. I know you said that was your target audience. Haha, yeah, I think we were both editing our posts at the same time. I will definitely be looking into these. I appreciate you telling me about them. I had looked for manual (non assisted and non auto) button locks while I was designing mine and really only found the Hogue X5. There are more options out there than I thought! I hope you can sense my enthusiasm. I'll be looking forward to whatever progress you post. Haha, thanks! I'll definitely keep you posted. I'm excited to start prototyping to see how my lock design feels (which seems not as original as I was thinking ). Tighe and friends button locks have really nice flipping action. Very cool, love the simple front flipper lines with a button lock. Today was the first day I'd heard of his knives. They look really good. I wish I could see the inside of the knife and how he did his closed position with the button lock. If the price is right, I might have to look at picking one up. Button lock flippers are awesome. One suggestion I have, if you can do it, is to make the flipper spine aligned, like G&G Hawk knives do. It gives better action and an all around more unique knife. - Add a cut out into the milled clip, you loose a tiny bit of weight but more importantly it'll be more springy. - Shrink the width of the scale so the bottom of the scale is more inline with the blade and you don't have that much of a "step" the back of the blade will stick out a bit, but I don't see a problem with it. Again just my personal two preferences. Very clean design. I like it. I am a sucker for front flippers. If the blade is thin at the stock (<0.12") and the edge bevel (<0.010"), I would be all over it. Thanks! I'll be keeping this thread update with my progress. As for your suggestion, I'm not sure I follow you. Make the flipper spine aligned with what? I like the idea of having the machined clip a little more springy, I might just have to do that. I also see what you're saying about the width of the handle. My original idea was having the blade completely hidden in the handle, but I like the look of the knife in the open position much better in your rendering. I'll see how it looks with some of the spine of the knife showing in the closed position. Thanks so much for the tips! I definitely want to keep the blade stock under .12 so that wont be a problem. Being as this is the first knife I'm designing and getting manufactured, I'll have to see what the edge bevel comes out to and tweak it as needed. Thanks for your interest in the knife! b00n and miso2 like this. Very cool! I love front flippers and I love button locks. Would really like to see this as 3.25 inch blade as that is a largely untapped market. There are far too few 3.25 inch knives. I will almost certainly get this knife. What do I have to look for to get updates so I will know when it is out? Is there some way to get on a waiting list? Last note; personally my favourite clip is the simple yet effective wire clip like like. There are too many thick frame locks out there. Thin blade button lock would fill a nice niche I think. I like the edge line very much, too. W. Anderson and mdrgn79 like this. I'm glad you are excited about the knife! There is no waiting list quite yet, once I get some prototyping done and feel good about the lock design I will definitely let you all know and start figuring out orders. I will keep this thread updated with my progress so you can keep up to date. Thanks for your interest! I have to say, I absolutely love the wire clip too. 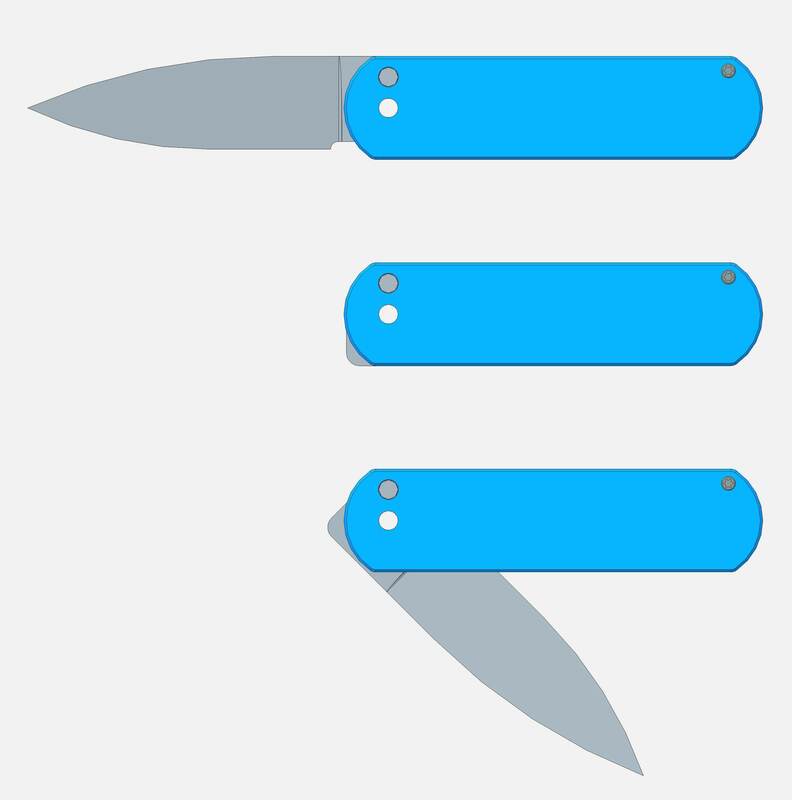 TBH, that was my first thought when I started designing the knife. I never made a CAD model of it though, I didn't know if it would fit the "style" of the knife. But now that you bring it up, I might have to give it a shot and see how it looks. Thanks!